This multi-function keyboard runs on either batteries or wall cord for the ultimate portable convenience. Standard keys: 61. Color: Black. GREAT FOR BEGINNERS: This simple-to-use, multi-function keyboard features 61 standard-size keys, providing both a traditional piano and organ feel for versatile and easy learning. Comes with usb cable. Works perfectly! Condition is Used. This keyboard has been collecting dust in my closet for the past 3 years. Works perfectly. Also note that monitor settings may vary from computer to computer and may distort actual colors. About Item. AKAI MPK Mini Keyboard Synthesizer. Condition is Used. Shipped with USPS Priority Mail. 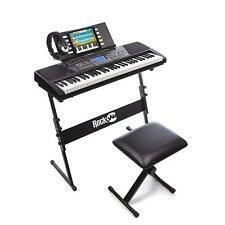 Includes: -MPK Mini -usb cable -manuals DOES NOT INCLUDE ORIGINAL SOFTWARE This keyboard does not require original software to use. Polyphony 128 Notes. 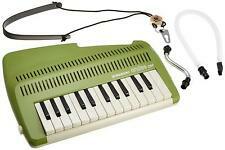 With no musical experience at all, you can be making music with the Roland GO:KEYS 61-key music creation keyboard. And with Bluetooth connectivity for audio and MIDI, the Roland GO:KEYS keyboard is perfect for use with your smartphone or tablet. Our 61-key electronic keyboard with touch-sensitive keys comprises many built-in features to create new musical compositions or cover an array of music genres and styles. A touch function allows for quick and easy settings. You can layer multiple sounds together in “Dual” mode, or split two sounds across the keyboard in “Split” mode. You can even record your own songs using the “Record” mode! Need a little help?. 61 piano-style keys with built-in speakers. 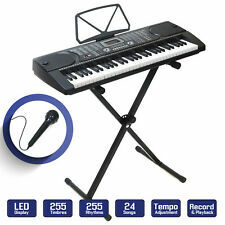 Capture the sounds of your favourite instruments in one convenient place with an electronic keyboard. These digital delights let you produce the sounds of pianos, organs, guitars, drums, and many other instruments - without taking up any extra space. Useful across the musical spectrum, electronic keyboards are staples for professionals, amateurs, students, and anyone who loves the magic of music. What do full-service electronic keyboards consist of? Electronic keyboards are complex instruments made up of a variety of useful components. The most visible part is the keyboard which serves the same purpose as a piano keyboard but also brings many additional features to the table. Other vital components can include headphone jacks, digital sound databases, amplifiers, weighted-keys, and microprocessors. Weighted keys respond proportionally to the force with which you strike them, providing you with a life-like feel that can improve musical performance. In addition to these basic features, many electronic piano models offer you a slew of sampled and recorded sounds. Is there a big difference between types of electronic keyboards? The difference between digital pianos, electric pianos, and electronic keyboards can be stark. Digital pianos and electric pianos strive to imitate regular acoustic pianos as closely as possible. Electronic keyboards, on the other hand, are self-contained studios that mimic, sample, and manipulate the sounds of any number of instruments. What are some features you should look for? Amplifier system strength. Choosing a keyboard that has a powerful amplifying system gives you options. If you find the need for high-output performances, you will be ready for the challenge. Plus, high-wattage amplifiers infuse quiet tones with warmth and soul. Alternative tunings. By selecting a keyboard that includes alternative tunings, you will give yourself the power to create new and unique sounds. Special effects. Some common audio augmentations include concert hall effects and outdoor effects among others. Ergonomics. Since you may spend many hours performing and practicing, you should choose a model that is comfortable. An instrument with a solid layout should include controls placed in proper proximity to each other as well as plainly-marked buttons, tabs, and panels. Polyphonic capabilities. This refers to the ability of your portable keyboard to clearly broadcast multiple tones simultaneously. Models with greater levels of polyphonic tone give you greater musical depth. What is MIDI and do you need it? The Musical Instrument Digital Interface (MIDI) is a ubiquitous communications standard that enables various kinds of electronic devices to interact with each other. The range of MIDI-capable equipment includes sequencing machines, expanders, computers, and portable keyboards.